When I heard that the body of Ron "Pigpen" McKernan had been found in his Marin County apartment, I immediately remembered a Grateful Dead concert of a couple of years ago. For sheer energetic joy I still think it is the best rock concert I've ever been to, and Pigpen was the star. And then...along came Pigpen. He had been shaking a tambourine in a bemused sort of way, holding it up by his ear as if it were a seashell and he was listening for the ocean, but now he put it down on top of a speaker and walked to the front of the stage, with Garcia, Lesh and Weir stretched out behind him. He was wearing a big-brimmed cowboy hat with the sides rolled up and the hat band was actually a swatch of colored cloth that hung down in back by his long pigtail. With the band rocking along behind him, he picked a microphone off a stand and held it out in front of him the way a knife fighter would. He made a dagger gesture with the mike and, even though he didn't move his feet, his body seemed to make a little rush forward at the audience. He poked again at the audience with the mike and the band cut back on the volume and left him a hole. Glaring at the audience as if he had just caught the whole bunch of them in bed with his old lady, but with a thin smile at the corner of his lips, he stepped forward and then began to sing: "Without a warning...you broke my heart"
His body began to rock back and forth, the band came in louder and stronger than ever and buddy that was all she wrote. Pigpen shouted and growled and screamed, he made little rushes across the stage, he did his Big Mama Thornton routine and his Otis Redding routine and his Little Richard routine and the place just went crazy as he hopped around the stage, screaming again and again, "Turn on your lovelight...Turn on your lovelight." As the concert came to a close with explosions of drums and shrieking of guitars, and the applause and cheers began swelling up from the audience, a tall black woman with the biggest Afro in town jumped up on that stage and began hugging and kissing Pigpen, swinging him around like a doll. Pigpen just went limp in her arms and, for the first time all night, he grinned. When we originally recorded this back on August 23-24, 1968, our record company then was Warner Bros. Records. 1" - 8 track was the very rage and State-of-the-Art of the recording industry. Because our approach to recording was then considered controversial (years ahead of our time), Warner Bros. would not entrust this new equipment to us without their engineers chaperoning. The engineers they sent to us were accustomed to recording Big Band style and were not familiar with Rock & Roll close microphone techniques. This together with the fact that Mickey and Billy's drums were premixed one to a track and the vocal and audience microphones were also combined, gave an immense amount of leakage. When we first began making rough mixes of these tracks, we noticed the combined leakage of every instrument onto every track. This caused severe phase cancellation and time smear that reduced the time image to nothing. So, the challenge to bring back these tapes wasn't reviving the sound of the instruments, but, rather correcting and restoring the immense time smear disparity. Enter Don Pearson, now Dr. Don the Time Master, and B&K 2032 F.F.T. analyzer. We used Phil's bass track for the time center, and compared this track to the others. Thus we were able to measure the distance in time between the various microphones. Using this information, we then transferred the delay time measured by the analyzer, to TC1280 delay units. This along with careful mixing achieved a nearly perfect stereo image. In headphones, you will be standing on the front center of the stage and you'll be able to tell where everyone is. This show was recorded on two consecutive nights. The band's equipment had been taken down at the end of one night and set up again the next. We were able to measure that the equipment was set up approximately one foot different than it was the night before. Because of the magic of today's technology, we are able to appreciate a tape that was unusable before. HOORAY! 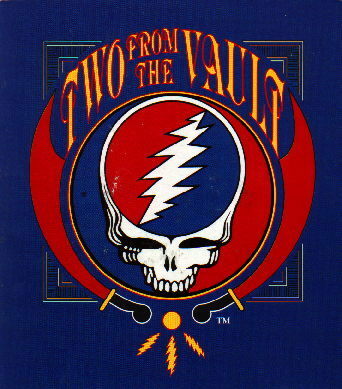 Album Artwork, c1992 Grateful Dead Merchandising Inc.
Two From The Vault was released in May 1992. This album was taped over two nights, August 23 & 24, 1968, at the Shrine Auditorium in Los Angeles.